Another week being surrounded by 20,000 other educators is over and it is time to decompress and reflect over what I have learned. 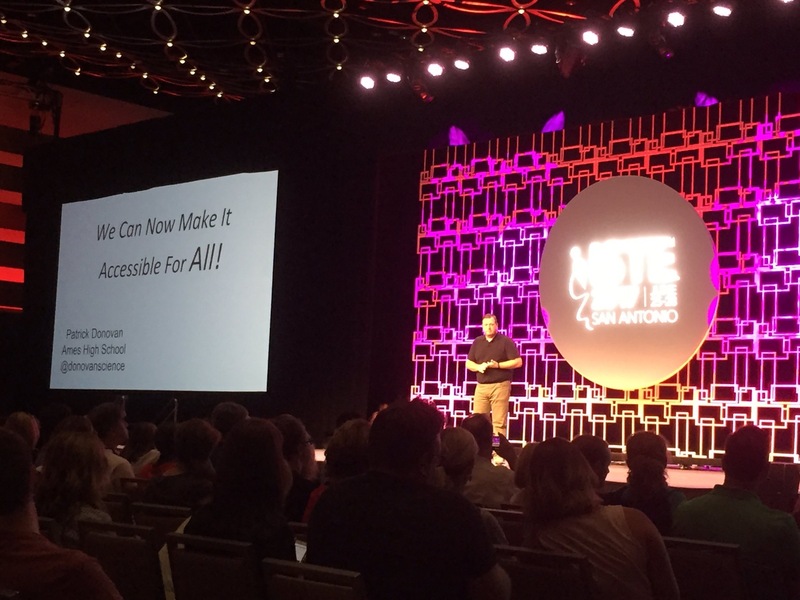 ISTE is a large conference and there is a lot you can learn and take away. 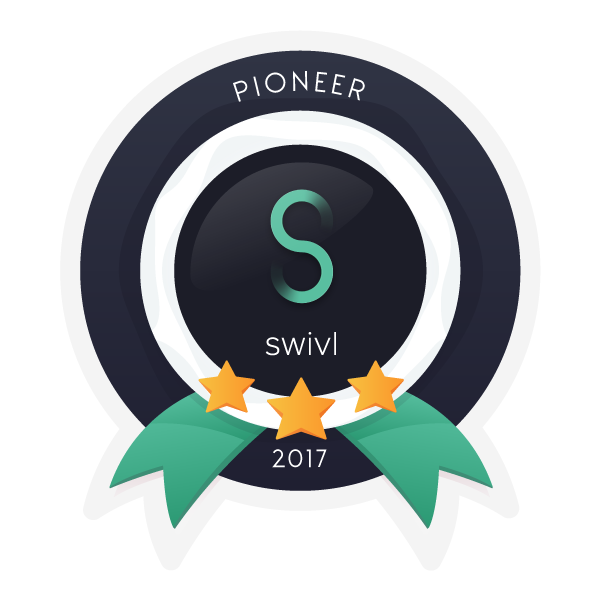 This year I challenged myself to present multiple times and even submitted a proposal for an Ignite (5 minute presentation where you have 20 slides that auto advance every 15 seconds) and it was accepted. The Ignite happened on the first real day of the conference, Sunday, and was heavily attended by over 1200 attendees. One of the great things about this Ignite is that students were also presenting and sharing their voice and viewpoints. There was a great group of educators presenting and I am very happy to be connected to them through this fun experience. While this was my first time doing an Ignite, it was a little nerve wracking to be doing it in front of such a large crowd but since this was my story I was sharing, it was easier than I thought. I was sharing how my experience having to wear a hearing aid in elementary school in order to learn relates to how many of our students can use technology to help them learn as best as they can. We have a tremendous number of students who have some cognitive, psychological, or physical issue that keeps them from learning as well as they could. Using assistive technology, and designing for accessibility when we publish or share things, we can help so many students learn as best as they can. While presenting in front of your peers can cause many to get nervous, I feel that we grow by sharing our learning and experiences especially as it causes us to reflect before we share. I have always been a big proponent of connecting with other educators in order to help ourselves grow both as learners and as teachers. Last year I was lucky enough to get connected with a group of great educators when I participated in the Google Innovator Academy and this has helped me greatly in my journey to being a more connected educator. Although only about half of our group made it to ISTE this year, we found multiple times to connect back up including the annual social for Google Education Trainers and Innovators. My #COL16 family has kept me growing by sharing out their great ideas, accomplishments, and passions. They are a great group and I hope to keep growing with them. I was also able to connect with other Innovators by joining some for a panel about the Google Innovation Academy. The Monday morning of ISTE we were able to share our experiences taking part in the Academy and everything related to that. The big thing I shared was the impact of being connected to a great group of educators. It was fun to hear how others grew from their experience and to also share the stage with some great people. The team in charge of the Innovation Academy is a great one and the experience is wonderful. I always make sure to spend some time in each of the poster sessions at ISTE. While there were some sessions I had to make sure to go to, I find that you can learn a lot in a short amount of time at the poster sessions. You also get a better chance to ask questions and make connections when you are in a more informal setting than during a full 50 minute session. There is a common theme during each poster session and you can get a large number of resources while having a few conversations along the way. It usually takes me a couple weeks after I get back to go through all of my notes and I usually have a few more questions to send their way. If you make it to ISTE, make sure you take some time for the poster sessions. The Playgrounds are also provide a similar experience as they are places where smaller groups can learn from a presenter in shorter segments of time. This was my first time taking part in the Google for Education Playground where I shared about Google Sheets. There were a lot of great presentations going on all at the same time in a smaller area and you could easily talk to others. The biggest piece of advice that I would give to anyone who attends ISTE is to make sure you are focused on being a learner. There are too many that attend conferences like this and do not learn anything besides who has the best swag. There are people who spend more time in the exhibitor hall collecting trinkets than making time to learn and connect with others. My hope is that anyone who attends a conference that their school district sends them to, will take the time to share their learnings with their colleagues. I hope to have my resources and other information shared with my fellow teachers in the next week or so. The best way we can help our school to improve is to share what we learn with others. It is much better to learn together than to go it alone. 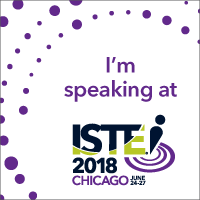 Remember this if you are lucky enough to attend ISTE 2018 in Chicago next year!